The University of Idaho has one architectural marvel on its campus with the "Kibbie Dome," a sports arena that dates to the 1970s and whose inside has been likened to a tin can cut in half, thanks to its arched roof of wood-and-steel trusses. Now it's gunning for another, right next door. The proposed 4,200-seat Idaho Central Credit Union (ICCU) Arena will have a structure that consists primarily of wood, using innovative construction technology that is gradually finding its way into new campus buildings across the U.S. The trend has been driven by an aggressive effort from the wood-products industry to generate demand for the emerging market segment. And it is feeding colleges' desire to show off commitments to sustainability, local industry and innovation. It gained some momentum last month with news of up to $1 million in grant money to help colleges add mass timber buildings to their campuses. Campus architecture follows no distinct formula. But some styles are more popular than others: turn-of-the-century Gothic Revival buildings; the minimal and glassy designs of the mid-20th century; their boxy and brute successors. And today, a new class of energy-efficient structures that pull from and give back to the environment. These buildings are sometimes used as tools to showcase advances in design and engineering, drawing eyes and acclaim to the institutions that house them. 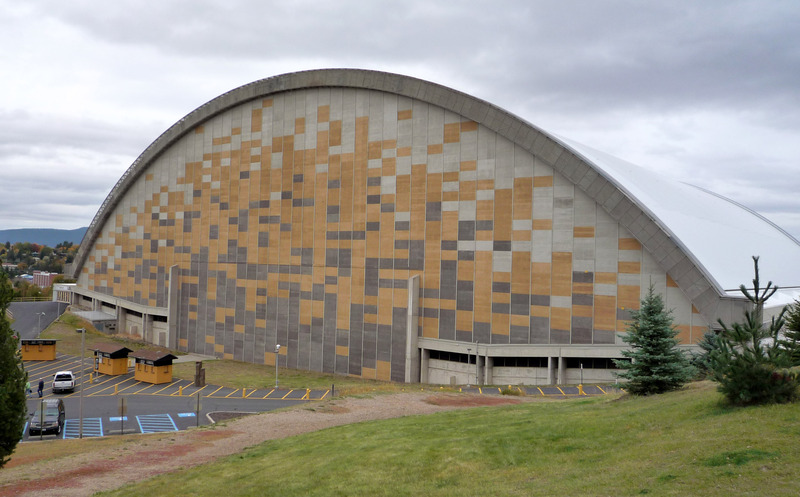 The Kibbie Dome, formally the Kibbie-ASUI Activity Center, was among them, winning an award in 1976 from the American Society of Civil Engineers for its massive arches that span 400 feet and reach up to 144 feet off the ground. The Kibbie Dome at the University of Idaho. With the ICCU Arena, U of Idaho wants another showpiece building that nods to the state's timber industry and taps into the college's programs in natural resources, architecture and engineering. It already houses a small mass timber building on campus, and its plans for the new arena won the support of an industry eager to see larger structures made of new kinds of wood products. "We realized this was a great way to engage them and to make a truly stunning building, so it just became a very logical thing to do," U of Idaho President Chuck Staben said. Supporters hail mass timber's potential: the ability to speed up construction timelines in an industry plagued by inefficiencies; less environmental wear and tear; an attractive visual aesthetic; and the economic contribution of skilled jobs in an emerging industry. They're also quick to note wood construction at this scale is not new — and that mass timber is different from the assemblages of two-by-fours and plywood that frame American homes. Mass timber covers a range of construction materials consisting of smaller pieces of wood glued together in ways that increase the overall strength of the product. Glulam beams are among the most common. A newer option is cross-laminated timber (CLT), which is made of dimensional lumber stacked crosswise and bonded together for use in structural wall panels, roofs and floor plates. Early adopters, including some colleges, have used demonstration projects to help mass timber, particularly CLT, claim a formal spot in the model building code. Those buildings showed that mass timber could be used in lieu of concrete and steel in certain types of construction. "We've got this building material that is barely penetrating the U.S. market — it's not a huge factor just yet," said Michael Goergen, vice president of innovation at the U.S. Endowment for Forestry and Communities, which is sponsoring the new grant. This kind of construction is further along outside of the U.S., with mass timber buildings ranging from 10 to 20 stories and beyond underway or completed in Canada, the United Kingdom, Scandinavia and elsewhere. For its part, the U.S. boasts seven- and eight-story mass timber buildings in Minneapolis and Portland, Oregon, with larger projects planned. The University of Massachusetts Amherst's mass timber Design Building leaves much of its wood structure exposed for students to study. College campuses are an attractive seeding ground for mass timber construction, partly due to their role in helping form young minds. "Universities are in a little bit of a unique position for demonstration buildings because we are educational centers," said Russell Edgar, senior lab operations and wood composites manager at the University of Maine's Advanced Structures and Composites Center. "A demonstration building in which students are studying different materials and why different materials are chosen for different reasons and applications — it's a perfect place to demonstrate these things to the future leaders of these technologies." The campus has a few mass timber buildings, and Edgar's team plans to submit a proposal for the U.S. Endowment's grant. One of their goals, he said, is to support a mass timber demonstration project in Maine, specifically one that uses CLT. There are 34 mass timber buildings completed or in the works on U.S. college campuses, according to the Softwood Lumber Board. Those projects are among nearly 500 multifamily, commercial and institutional mass timber projects underway or completed across the country. Students attend class in the University of Massachusetts Amherst's Design Building. 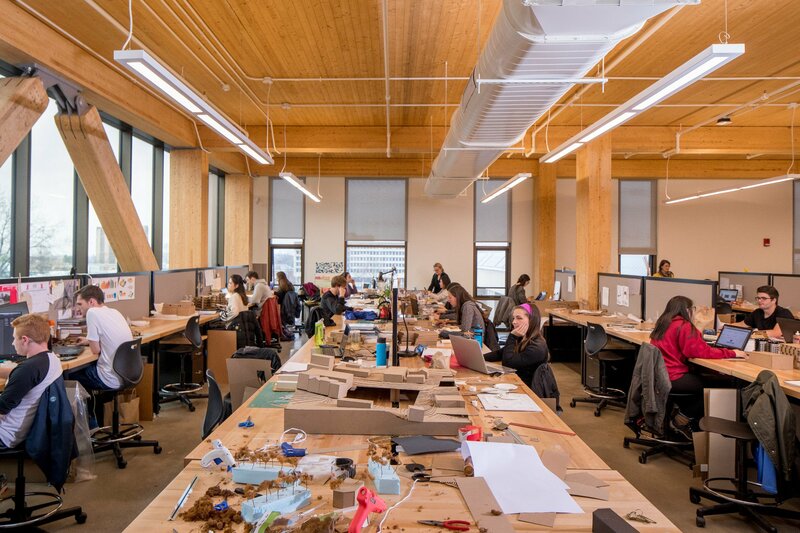 Further south, the University of Massachusetts Amherst is using a mass timber building to educate students studying architecture and construction. The idea for the John W. Olver Design Building came from "grassroots efforts" by professors and students to bring together related academic disciplines in a single structure, said Stephen Schreiber, chair of the university's architecture department. The building, at four stories and 87,500 gross square feet, cost $52 million and took 18 months to construct out of a combination of CLT and glulam as well as steel and concrete. It is home to the Building and Construction Technology program, the Department of Architecture and the Department of Landscape Architecture and Regional Planning. Much of the complex structure is exposed so students and visitors can see how it came together, Schreiber said. The University of Arkansas is using mass timber for a pair of residence halls, which are under construction. They, too, will be a teaching tool, wrote Mike Johnson, the university's associate vice chancellor of facilities management, in an email to Education Dive. "Timber offers educational opportunities through an assessment of the unique structural components," he explained. 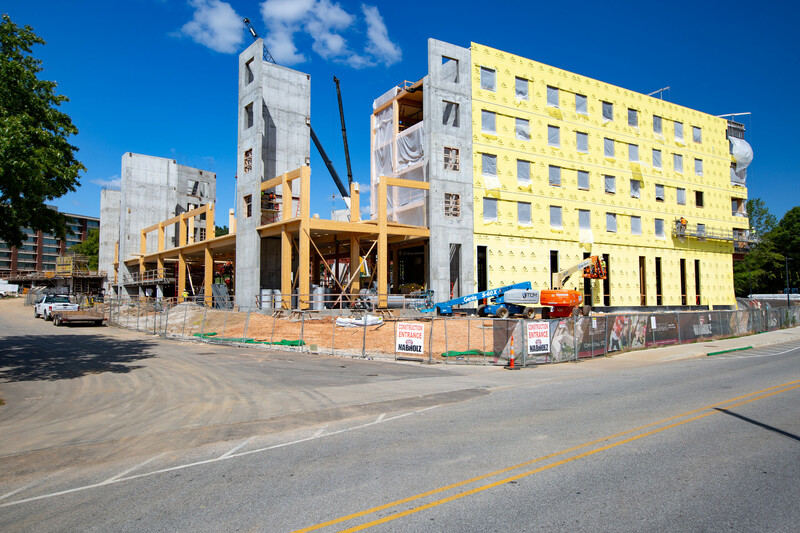 A pair of residence halls using mass timber are under construction at the University of Arkansas. The $78 million project, which is slated to open before students move in for the fall semester, will house about 700 students. It won't be the only building of its kind on campus; the Library Annex, completed last year, is also made of mass timber. Other mass timber buildings on U.S. college campuses include the R.W. Kern Center at Hampshire College and Duke University's Karsh Alumni and Visitors Center. 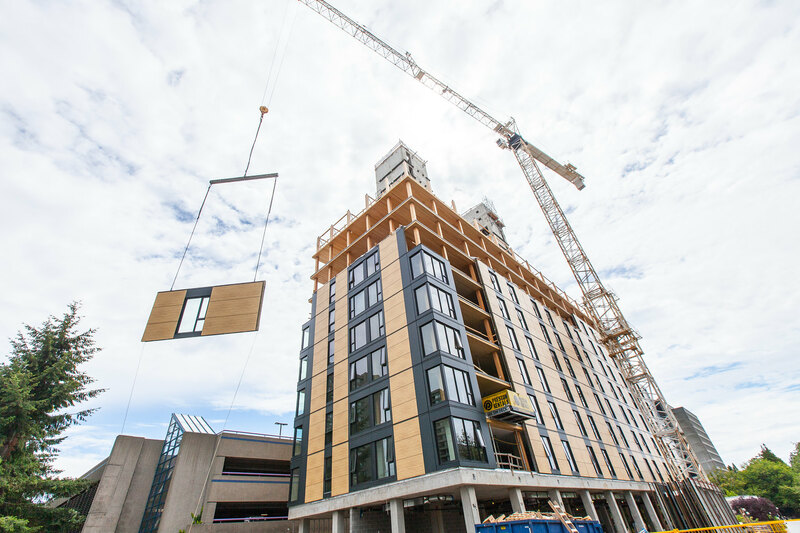 In Canada, an 18-story residence hall has taken the material to new heights. 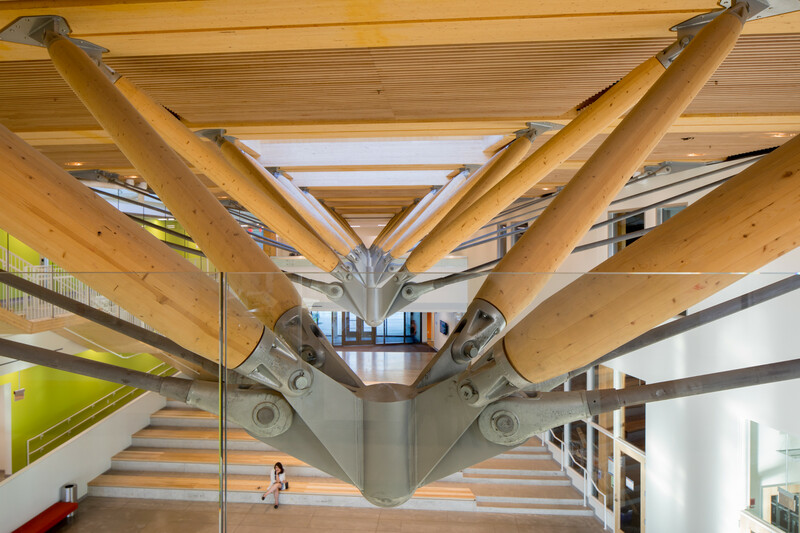 Brock Commons, at The University of British Columbia, is a popular case study for mass timber's potential, with its structural components made off-site and assembled in less than 70 days. When it opened it was the tallest mass timber structure in the world. Although the buildings fill largely practical needs — housing, classroom space, storage — the universities see them as statement pieces for their campuses. "That's a really big sell for mass timber," Schreiber said. "They are sort of expressions of a culture, and they are expressions of a time." Brock Commons under construction at The University of British Columbia. Despite UMass's success with the Design Building, it has since struggled to keep traction with mass timber, Schreiber said, building later structures out of more conventional materials. Even the wood Design Building wasn't a sure bet. "A $3 million grant from the state is what made the difference from our building being built out of steel and being built out of wood," he noted. The funds were tied to the project being a demonstration building to help drum up support for mass timber construction. The university also received some wood as a donation from the state forester as well as an in-kind gift of smart glass for the building. Sources interviewed for this story acknowledged the unique challenge of building with mass timber, even with industry backing. Among them is a knowledge gap around the materials and methods as well as the lack of a strong national supply chain for some of the products, such as CLT. Improvement on both of those points are goals of the U.S. Endowment's grant. "Unfortunately it's that chicken-and-egg situation where, 'I'll build the factory when there's the right amount of demand,' and, 'I'll demand it when there's the right amount of supply,'" Goergen said. "We're trying to work on both ends of that spectrum. … Stimulating that demand is really what's going to be the market force for the supply side to catch up." To that end, wood products maker Boise Cascade agreed to mass timber for U of Idaho's project as an in-kind gift, said Mike Perry, special assistant to the university's president and the primary fundraiser for the arena. They will use woo provided by the university's own forest. Those materials account for about 10% of the project's anticipated $46 million price tag, a small slice of the overall cost but important in getting the industry on board, he added. The university also got a $250,000 grant from the U.S. Forest Service for design and engineering work on the project. A rendering of the proposed Idaho Central Credit Union Arena. Other support comes through a $10 million naming gift from Idaho Central Credit Union. "They saw this as a brand opportunity," Perry said. A proposed increase in student facilities fees from $30 to $60 would generate another $18 million toward the arena — the environmental sustainability and regional flare, Staben said, has "made it an easier sell" to students — as well as two private gifts of $2.5 million each and other smaller donations. Construction costs, logistical challenges and the desire for a fully wood structure drove the arena's price tag up from the initial $30 million projection — a figure Staben says, in hindsight, was "inaccurate" and "probably somewhat irresponsible." Another, perhaps bigger hurdle U of Idaho and other institutions must clear when using mass timber is finding the right design and construction partners, and getting their own teams on board. With the former, U of Idaho has had assistance from the wood industry, which provided consulting help. The university also picked an architect it had worked with already. That helped build internal consensus, as the university explored the potential challenges of tackling a complex design with a novel material. "It was a lot of different aspects," said Raymond Pankopf, director of architectural and engineering services at the university. "It's the (building) code, it's the (curved roof) spans, it's working with the industry partner in their production process. It's been a tremendous learning experience for everyone involved." Staben cautions that higher ed leaders may need to "broaden their horizons" about wood's potential before taking on a project like this. 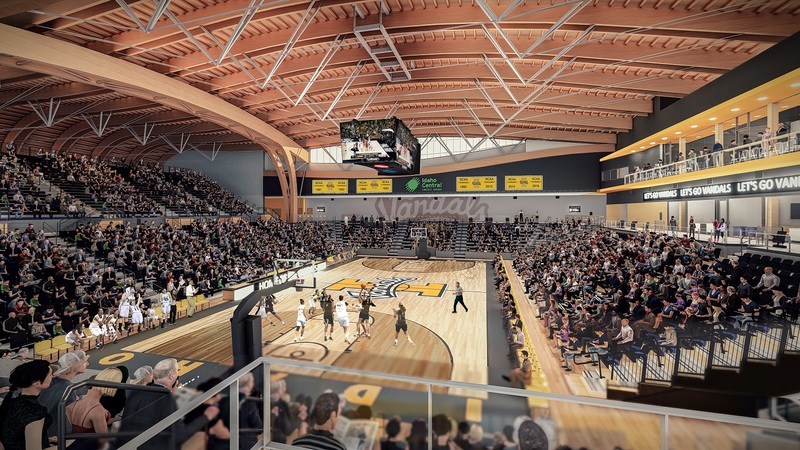 A rendering of the interior of the Idaho Central Credit Union Arena. The U.S. Endowment's grant, along with a bevy of case studies and other resources that the wood products industry has developed, intend to help interested parties navigate around some of those hurdles. But earlier efforts to drive the use of mass timber serve as cautionary tales. For all the support they may garner, these buildings are still vulnerable to the volatility of construction in the current economy. The two winners of a 2015 grant from the U.S. Department of Agriculture to subsidize mass timber construction in taller buildings have both been shelved, largely due to factors beyond the material used. More support for mass timber is nestled within the recently passed Farm Bill, which includes funding for research on this kind of construction through the Timber Innovation Act. Goergen is optimistic. "I hope some university creates the most ambitious project that we can possibly take a look at because that will be exciting," he said of the U.S. Endowment's grant. "If a building doesn't get built out of it, that's OK …. The most important thing is that we're learning, the campuses are learning and those future students are learning what's possible building with this material."